EINDHOVEN, NETHERLANDS and SAN JOSE, CA--(Marketwire - April 20, 2010) - NXP Semiconductors today announced sampling of the world's smallest general-market 32-bit microcontroller, the LPC1102, based on the Cortex-M0 processor. Unleashing unprecedented computing power in 5mm2 of PCB area, this device is targeted at very high volume applications requiring an ultra-miniature board footprint. NXP's LPC1100 is the lowest-priced 32-bit MCU solution in the market, bringing higher value and ease of use than existing 8/16-bit microcontrollers through unprecedented performance, simplicity, low power, and more importantly, dramatic reductions in code size for all 8/16-bit applications. As the newest member of the highly successful LPC1100 microcontroller family, the addition of the LPC1102 delivers the same key features of low power, high performance and value, while adding the new dimension of miniaturization. The LPC1102, with 32KB of Flash and 8KB of RAM on-chip, is available in Wafer Level Chip Scale Packaging (WL-CSP) with dimensions of 2.17 mm2 x 2.32 mm2, thickness of 0.6 mm, and pitch of 0.5 mm. "More and more of our customers are limited by PCB space as they design products that are racing toward continual miniaturization, while also being expected to deliver more features, performance, as well as longer battery life," said Geoff Lees, vice president and general manager, microcontroller product line, NXP Semiconductors. "The LPC1102 with its 2 x 2 mm footprint is the solution." "The very rapid roll-out and ongoing innovation by NXP is remarkable and demonstrates the strength and versatility of the ARM Cortex-M0 processor," said Richard York, director of product marketing, Processor Division, ARM. "Clearly NXP is reaping the benefits as shown by its increasing product portfolio of innovative and successful new ARM processor-based products." Key product features include a 4-channel 10-bit ADC, one UART, one SPI, two 32-bit and two 16-bit timers, and one 24-bit system timer. SWD debugging and programming with four breakpoints and two watchpoints are also included. A total of eleven I/O functions also double as general purpose input and output GPIO for maximum flexibility. Offering very low power consumption with active mode current as low as 130uA/MHz, the LPC1102 features an internal IRC oscillator, accurate to ±1 percent over the industrial temperature and voltage range. It can also be clocked with an external source. The LPC1102 will be supported by a wide range of third party development tools, as well as NXP's LPCXpresso development platform featuring a powerful Eclipse-based IDE with an all-new intuitive NXP-designed user interface, optimized Cortex-M0 compiler and libraries. The LPC-Link debug probe and target board provides users with all the tools needed to accelerate product development and time-to-market. LPCXpresso supports the complete product design cycle, providing an end-to-end development solution. For more information, please visit www.nxp.com/lpcxpresso. Samples are available for key customers at ESC 2010 Silicon Valley April 27-29 and later in May worldwide. Volume production will start in Q4 2010. For pricing, please contact a local NXP sales office. 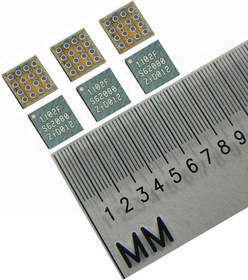 Additional products in the LPC1100 family will be introduced in Wafer Level Chip Scale Packaging later in 2010. Further information on the LPC1100 family is available at: http://ics.nxp.com/products/lpc1000/lpc11xx/. NXP Semiconductors provides High Performance Mixed Signal and Standard Product solutions that leverage its leading RF, Analog, Power Management, Interface, Security and Digital Processing expertise. These innovations are used in a wide range of automotive, identification, wireless infrastructure, lighting, industrial, mobile, consumer and computing applications. Headquartered in Europe, the company has about 27,000 employees working in more than 25 countries and posted sales of USD 3.8 billion in 2009.